This can also happen when a tractor has been sitting for a long period of time without being started. It usually happens because the oil pump pickup tube has come loose or the gasket on the oil pump is bad and the pump is “sucking air” rather than pulling oil up from the sump. Badly worn gears in the oil pump can cause it, too. It’s a sign that something in the oil pump area needs attention soon. The easiest way I’ve found to prime the pump and get it going again is to remove the oil pressure relief valve from the front of the engine. 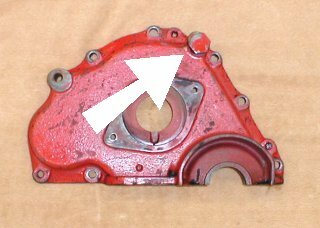 It is a 15/16″ nut on the top front of the timing cover just below the water pump. Remove the nut and pull out the spring and valve poppet. Get a trigger type squirt oil can and put the nozzle in the hole that the valve poppet goes into. Squirt several shots of motor oil into the hole. This oil will run down into the top side of the oil pump and collect on the pump gears. This is usually enough to prime the pump. Replace the poppet and spring and nut and fire it up. You should get oil pressure back again. If not, or if your oil pressure suddenly dropped to zero while the engine was running, remove the oil drain plug and verify that the pump pickup tube is still intact. It could have broken off at the pump which is above the oil level in the pan. The relief valve spring is designed to hold the poppet on the seat until oil pressure is 35-45 psi (Yes, the poppet IS supposed to have that flat spot on it). The relief valve only sets the maximum pressure attainable and has no effect on raising a lower pressure unless the spring is weak or broken. If your engine is in good shape, you will see 35-40 psi, hot or cold, at anything over an idle. Pressure at idle will be about 25. The main cause of low oil pressure is worn crankshaft bearings (main and rod bearings) followed by worn gears in the oil pump. The first symptoms of wear are good oil pressure when cold that drops off when the engine is hot. This is a sign that the clearances have opened up in there and the oil that has thinned when hot can now rush through the bearings faster than the pump can pump it. Oil pressure seems to be a topic that’s misunderstood by a lot of people and these questions show up a lot. Basically, to create oil pressure in the engine, the gear pump first moves the oil from the sump by pushing it up through the passages in the block and creating a flow. The resistance to this oil flow is what creates pressure. Like water flowing through a garden hose, there is flow but little or no pressure. Putting your thumb over the end of the hose makes a resistance to the flow which quickly builds pressure in the hose. In the engine, the close clearances at the crankshaft bearings create the resistance to the flow. The N series flathead engines are notorious for low oil pressure with age because the pump has very little excess volume (flow) capacity when the engine starts wearing out. The pump just can’t keep up with the leakage from worn bearings or shafts (no thumb on the end of the hose) and worn pump gears. The pump gear length was increased in the later 8Ns which helped the volume somewhat, but it’s still not enough as the engine wears. I’ve seen a lot of advice given that just a few PSI is plenty for these old engines. If a person has just a rough understanding of what the oil pressure does they will see right away that 5-10 PSI is not nearly enough for any engine to survive on. The three main areas in the N engine that depend on oil pressure to survive are the crankshaft main bearings, the rod bearings, and the camshaft bores. When new, the shaft (crank or cam) runs inside a slightly larger bore that is fed oil under pressure. The clearance around the shaft fills with pressurized oil and the shaft runs centered in that oil film and (in theory) never touches the outside of the bore. If this condition can be maintained the wear on the shaft and bore (bearing) is extremely slight, especially if the oil is kept clean. The fly in the ointment comes when the engine is stopped and the oil supply stops. The shaft then contacts the bottom of it’s bore and rubs during startup until the oil pressure can center the shaft again. As the load on the engine increases, the amount of oil pressure required to keep the shaft floating in the center also increases. If the oil pressure is low, the shaft is not supported on the oil film and very rapid wear occurs. The quick and dirty drawing below shows an exaggerated crossection of oil film on a shaft that is being supported by the oil pressure and what happens when the pressure is too low. The engineer who designs these engines could tell you how much load on the engine would overcome the oil pressure or how much pressure is needed for it to work safely. I don’t know any of those numbers, but I know 5-10 PSI is barely enough for idling with no load. As soon as the rpm is increased or any load is applied it’s NOT enough. The photo below shows a lower bearing insert from an engine that had been running with low oil pressure. The insert has worn completely through the bearing material at the bottom position from the crankshaft rubbing on it. In addition, when pressure is low the crankshaft itself is also wearing badly and becoming out of round and the camshaft journals and it’s bores are wearing, too. The more it wears, the lower the oil pressure gets and it spirals rapidly until something starts knocking or lets go completely. Running with low pressure seriously abuses the engine. Thicker oil or thickening additives like STP will help increase the oil pressure, but they are a short term fix. It is possible to have a faulty (worn) pump causing low oil pressure (not creating enough flow) even when bearing clearances in the engine are ok. It’s also possible to have a good pump and badly worn bearings and crankshaft causing the low pressure. However, low oil pressure symptoms in a well used N tractor engine is almost always a combination of both. Rebuilding the engine so it again has the proper bearing clearances and pump gear clearances is the only true fix. We also hear about newly rebuilt engines that have low oil pressure. A proper rebuild of the engine and pump will result in a running oil pressure of 40-45 PSI cold and at least 35-40 PSI hot. If it’s less, something wasn’t done right during the rebuild, plain and simple. Camshaft journals and the cam bores in the block are often overlooked during rebuilds. Normally, excessive wear on the cam journals and bores is not an issue with N tractor engines. But if you do find one with excessive wear that requires the expensive machining job to fit the block with cam bearing inserts, you can bet that wear was caused by someone who thought 5 psi was enough and kept running the engine that way. Be sure to verify that your oil pressure gauge is reading accurately before you condemn the engine.